As a standalone product, the rapidly-convertible MS3 allows an operator to leverage the maneuverability of one-point attachment for direct action, or two-point attachment for stability. Single-hand adjustments and quick-release, positive-locking hardware provide flexibility and durability in a truly adaptable sling system. Used in conjunction with the Magpul ASAP® plate (sold separately), the MS3 enables seamless transitions into an array of shooting positions without getting bound or fouled. The MS3 concept allows switching from Weapon Shoulder to Reaction Shoulder for shooting around corners, under vehicles, or to minimize exposure. The MS3 can also increase operator survivability by keeping the weapon in the fight in case of injury to the operator’s shoulder, arm, or hand. The MS3 incorporates a new low profile quick-adjust Slider which minimizes bulk and allows for secure, yet effortless, sling adjustment. Webbing length has also been increased for a comfortable fit with all body types and armor configurations. Made in U.S.A. and 100% Berry Amendment compliant. 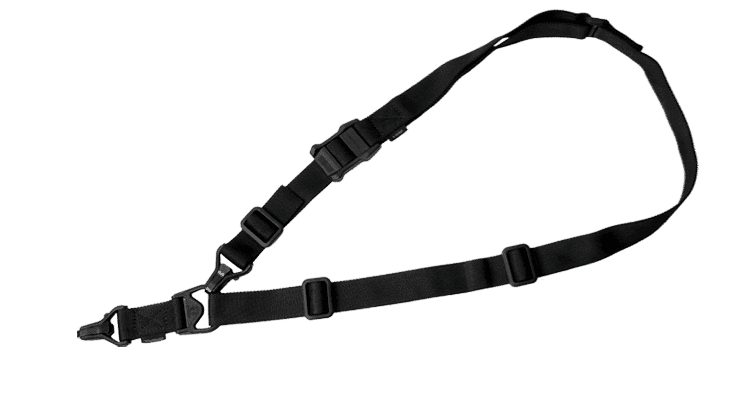 This sling is versatile and easy to install that gives you the flexibility to attach it in either a single or double configuration . I was surprised how easy it adjusts to tighten or loosen to meet your need with the slide buckle. As usual, the At3tactical team’s customer service is always top notch. Thanks for sharing your experience, Glen. We're glad you're satisfied with your purchase. Cheers! Very functional 1-2 point sling. easy attachment/detachment points with locks. Very durable. Thank you at3tactical for smooth transaction.